Sigma 18-200mm F3.5-6.3 DC Macro OS HSM C Canon mount lens review: Worthy upgrade? As the equivalent to a 28 to 300mm or thereabouts in 35mm terms, APS-C format 18-200mm zooms have become rightfully popular as a lens for all-round use. As a consequence of Sigma’s Global Vision strategy this revised version is the latest in a line of lens models from the company dating back to 2005 and features a number of refinements over its stabilized predecessor. Modifications include a reduction in weight and size, whilst maintaining image quality say Sigma. A double-sided aspherical element has helped reduce the weight, as has a new smaller AF actuator. As a result the new model is smaller by volume (by around 11%) at 3.4 x 2.8 in (86 x 70.7mm) and slightly lighter at 15.2 oz vs. 17.3 oz. Along with the usual assortment of SLD glass, sonic type AF motor and stabilizer, this 16 element design can focus to just 15.4 in (39cm) with a useful maximum magnification of 1:3. The new model is also compatible with firm’s optional USB dock and Optimization Pro software that allows the user to fine tune autofocus amongst other parameters. The Sigma 18-200mm f3.5-6.3 DC Macro HSM C is available now for $399. 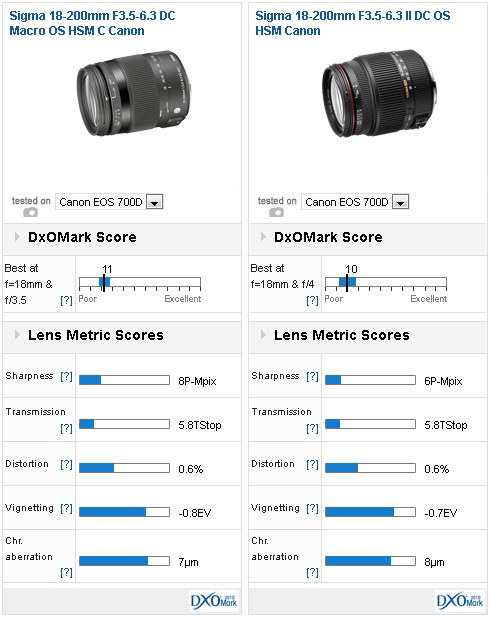 A DxOMark lens score of 12 points is above average in this class. It has slightly higher sharpness than expected at this level (not just a high peak sharpness equating to 9P-Mpix) Best of all perhaps, sharpness at 200mm is good at the initial aperture, at least in the center of the field. There’s some softness at the edges but it’s remarkable at this price. Vignetting and chromatic aberration are very well controlled and distortion is also kept to reasonably low levels at the wider end. Change focal length though and the barrel distortion changes quite abruptly to pincushion and is quite noticeable at 35mm to 50mm, but less so at longer focal lengths. 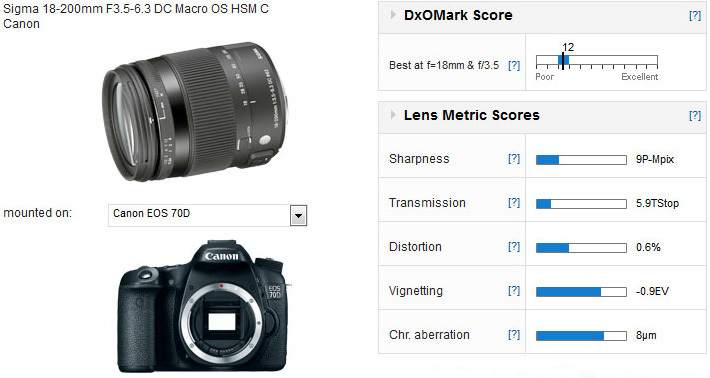 Mounted on the Canon EOS 70D, the new Sigma 18-200mm is the best performing model of its type in our database. 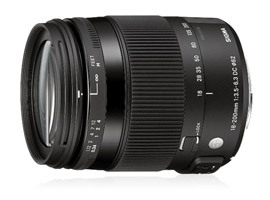 Not only is the new Sigma a good performer but also its modest price means that it’s one of the best value currently. 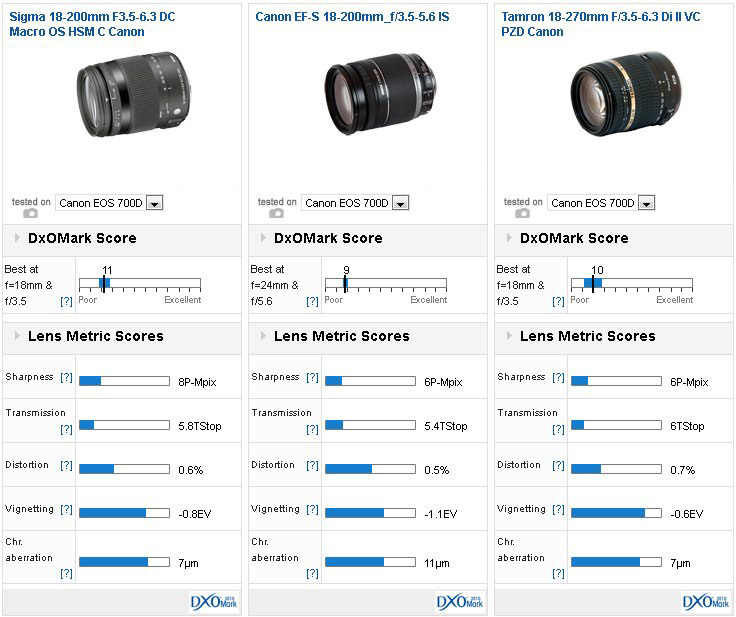 With similar DxOMark scores compared to its predecessor the new model appears to be only a minor improvement. But if we look more closely the significant advances have been made with regard to sharpness at the longer of the zoom range. Even when stopped down the older model was quite soft, even the center. At 18mm though the new model has some slight field curvature with an area of softness surrounding the center. The older model has better uniformity at the wider end, but not the same level of sharpness. 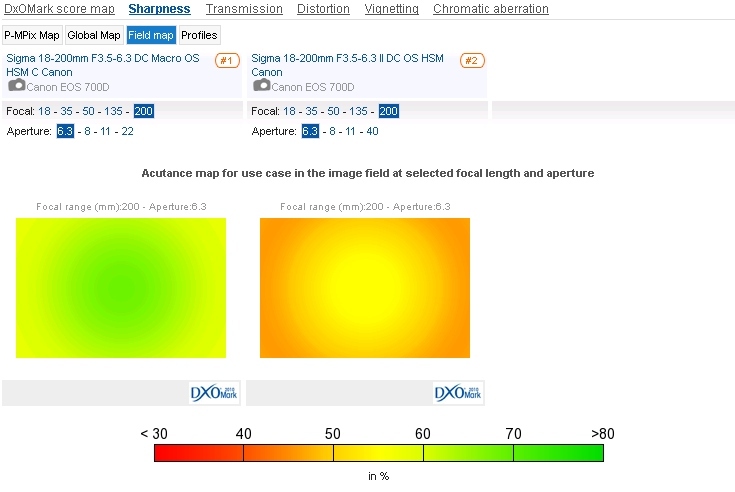 Transmission, distortion and vignetting are remarkably similar though the newer, revised optical formula has also reduced lateral chromatic aberration noticeable at either end on the older model. Canon users will no doubt contemplate the firm’s stabilized EF-S 18-200mm model and for good reason as it’s not a bad performer. Peak sharpness is a little low by comparison, but the Canon offsets to a degree this by having pretty good center sharpness wide-open at 200mm. It is also marginally faster at 6.5TStops, versus the Sigma’s 7.2TStops. To the Canon model’s detriment, it has higher barrel distortion, heavier vignetting and some troubling lateral chromatic aberration, but the latter is restricted to the 50-135mm range. 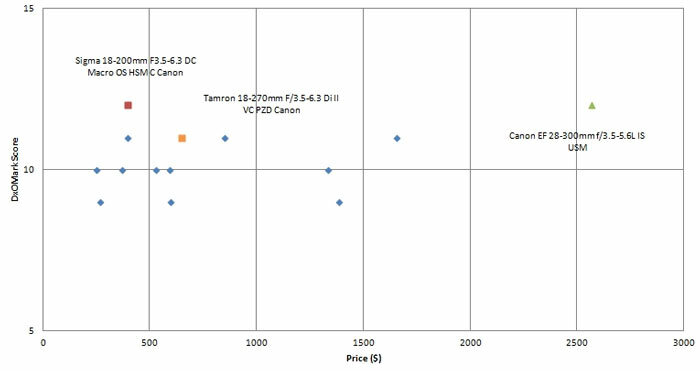 Tamron’s latest 16-element PZD (Piezo Drive) version of the stabilized 18-270mm is a promising option with its longer reach and equally small size. Not only that, but the price is quite modest at $449. It has similar sharpness to the earlier Sigma model but they’ve leapfrogged Tamron, particularly with regard to peak sharpness generally and center sharpness specifically wide-open at 200mm. Although the Tamron has similar transmission, distortion and vignetting the Sigma has lower levels of CA at 200mm, however the Tamron has practically no CA at 18mm. Sigma’s cosmetic revamp of the exterior and revision of the optical construction has resulted in a lens that not only looks classy but also produces results superior to rivals including those from Canon. A reduction in weight and size, albeit only slight makes this all the more tempting for travel, while the enhancement in sharpness and optical performance generally at the longer focal lengths is particularly valued in zoom like this. Although this has led to a certain amount of compromise with the performance at the wide-end, retaining the modest price of its predecessor the Sigma easily impresses.